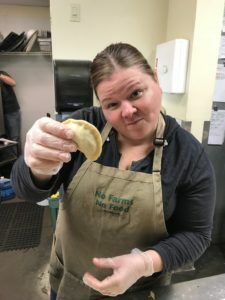 The most popular grocery item we have at Barstow’s Dairy Store and Bakery is our handmade pierogi. Homemade in enormous batches, it takes an army to make the dough, prepare the filling, hand-pinch each pierogi, boil in butter, and bag to be frozen and sold. The amount of labor and time it takes to make these delicious Polish dumplings, turns a regular day at Barstow’s into a full blown party! Family and friends, bakers, and staff gather in the kitchen to fill and pinch each pocket. Every pinch is like a signature! 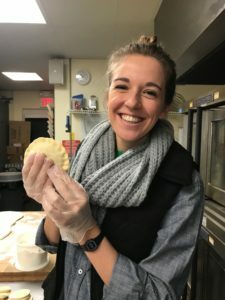 Under the close supervision of Shannon Barstow, these delightful pierogis come to life! 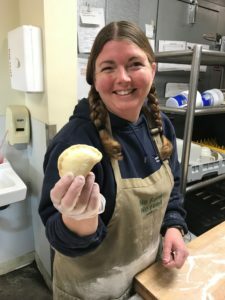 Leona Chmura hoped Shannon would like to learn her famous pierogi recipe when the store first opened in 2008. But with managing a new business, kitchen, and staff, Shannon had her hands full. It wasn’t until several years later that Leona and Shannon prepared her first batch of potato & farmer’s cheese in the store’s kitchen. Ever since, we’ve had a hard time keeping our pierogi stocked! We offer potato & cheese, cabbage, and cabbage & kielbasa pierogi year round in our frozen prepared foods section. Visiting from far away? Call us before you make the trip so we can set some aside for you. They go quick!